NCC Box is a secure cloud file storage and sharing tool that is available to all NCC faculty, staff and students. NCC Box provides unlimited storage, easy access to your files, and rich file sharing and collaboration features. 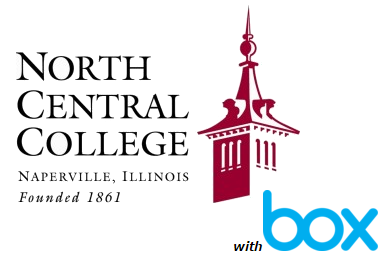 All NCC faculty, staff and students are eligible for NCC Box accounts. New to Box? Get started with their comprehensive on-boarding guide for new users. Expand the additional topics on this page to learn more about using NCC Box's features. Box Features - What can I do with Box? Securely share, collaborate and comment on files with resources both inside and beyond the North Central community. Learn how to upload files and folders to NCC Box using the quick tutorials below. Learn how to harness the collaborative power of NCC Box using the quick tutorials below. NCC Box is a great option for storing all of your files and folders even if you don't need to share them with anyone. Uploaded files and folders are private and not shared by default until you choose to share them. Learn more about managing and organizing your files with the quick tutorials below. Box Sync is a productivity tool that allows you to mirror data stored in your NCC Box account to your computer. You can then navigate and modify content stored on the Box website through your computer's file browsing interface, without having to use a web browser. Content that syncs down to your computer is available for offline access. If you modify the synced files locally, these changes are automatically applied to the files in your Box account. Box Sync is pre-installed on all campus Windows and Mac workstations. If Box Sync is not installed, please contact the Help Desk to request installation. To setup Box Sync, please launch Box Sync from the start menu or from applications. You will need to sign in twice to Box sync initially. Once Box sync is setup, it will create a folder under C:\Users\(username)\Box Sync where files can be saved.